Strawberries and strawberry jam are sandwiched between a buttery streusel-like mixture in these 100% whole grain strawberry oat bars! With a vegan and dairy-free option. Can also be made with all-purpose flour. 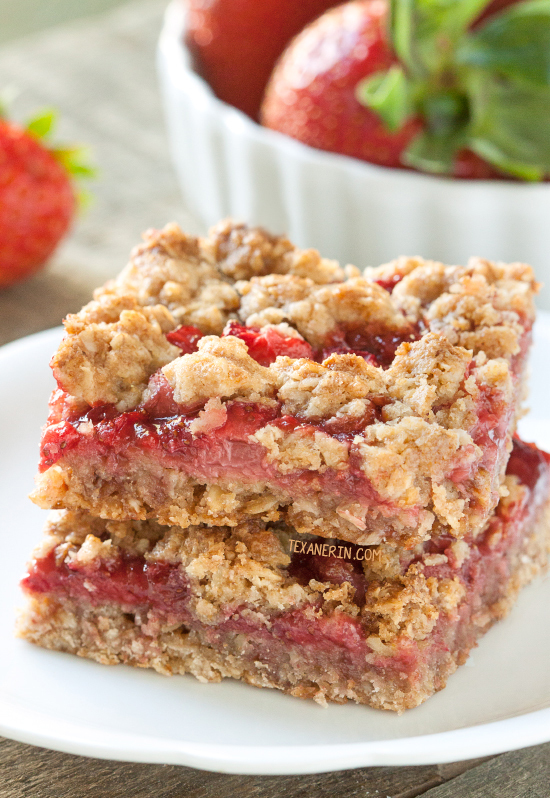 I’m not normally a fan of cooked strawberries but it definitely works in these bars! And I like that you can actually taste the butter in the crust and topping. There is quite a bit of butter but I don’t recommend reducing it as it’d change the consistency of the topping and possibly make it quite crumbly. One thing I’ve noticed lately is that butter and coconut oil are not interchangeable in recipes with crumble or streusel-like toppings. I’m sure this isn’t always the case but I did an experiment with some other oat bars. I made the exact same recipe but used butter for one batch and coconut oil in the other. The streusel-like oat topping in the coconut oil version flattened like a pancake while the topping in the butter version held it’s shape. The crust (which was the same stuff as the topping) was also a little oily. In the next batch, I tried reducing the coconut oil a little and it worked! So that’s why you see different amounts of butter and coconut oil called for in this recipe. I really recommend using a thicker type of jam. Using thin and runny jelly might result in a soggy crust. Here’s a super easy recipe for homemade strawberry jam. There’s no pectin involved and it just uses a little honey as the sweetener! Just mix a few ingredients together in a pot and let it cook. I wanted to make these strawberry oat bars because I had some terrible flavorless strawberries I wanted to use up. But you could still tell in the bars that I had used bad strawberries. So if you want the filling to taste good, use good strawberries. This might seem obvious but I thought that the strawberry jam might help with the taste issue. 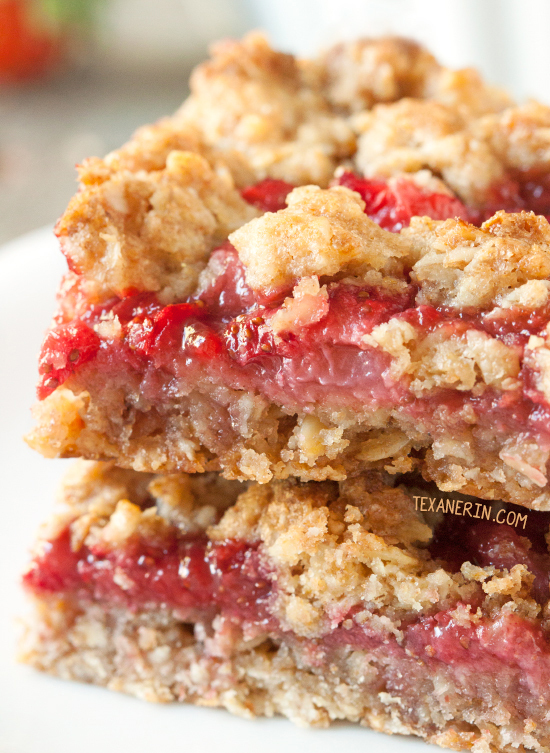 If strawberries aren’t your thing, I bet these would oat bars would be great with blueberries! Or any other berry that tickles your fancy. Preheat the oven to 375°F (190°C) and line an 8"x8" baking pan with parchment paper. In a large mixing bowl, mix together the oats, flour, sugar, zest, baking powder and salt. Cut in the butter or coconut oil using a pastry blender, two knives or your fingers, and mix until the dough comes together. The dough should not be very crumbly, but should stick together. Gently press two thirds of it onto the bottom of the prepared baking pan. Bake for 10-13 minutes or until the edges just start to turn brown. Meanwhile, prepare the filling. In a medium bowl, mix together the sliced strawberries, jam and vanilla. Spread this mixture over the baked crust and then evenly sprinkle the remaining oat mixture over the strawberry filling. Bake for another 25-30 minutes or until the top has lightly browned and the filling is bubbly. Let the bars cool completely and then refrigerate for 2 hours before cutting. Store any leftovers in the refrigerator for up to 4 days. These can also be frozen. 48 comments on “Strawberry Oat Bars (vegan, dairy-free, whole grain)” — Add one! I made these today with no fresg strawberries, just ED SMITH triple fruit no sugar added jam. Instead of brown sugar I used Swerve sweetener and instead of butter I used 1/2 cup nut butter 1/4 cup coconut oil. They turned out divine! I only used nut butter because I wanted them to taste like a peanut butter jam sandwich oat bar. Thanks for the recipe! I’m so glad that your version turned out well! Is 1/2 cup nut butter + 1/4 cup coconut oil a sub you’ve used before for butter? I’m wondering because I’d like to try it in some other recipes! I also love the sound of your PB&J version you made. :) Thanks for your comment! Did you chill them for 2 hours? Because they need to chill for them to become bar-like! So happy they exceeded your expectations. :) Thanks for your comment! Awesome! Happy to hear that. :) Good luck with your breakfast bar version! Hi there, this looks fabulous! Can I use quick steel cut oats? I accidentally got them instead of rolled oats. Hi! Thanks. :) And unfortunately not. I don’t believe that they can be used in baking (or not usually, anyway) as they have to be prepared in a special way. Sorry about that! Hello! I am wondering, if anyone has used almond flour for this? I just wonder if it would alter the flavor too much? 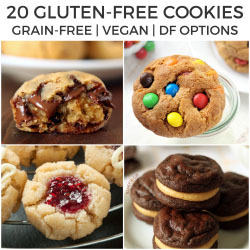 I made these with almond flour and they were so good! I used what the recipe called for, so 1:1 ratio. I was thinking about trying coconut oil, but I didn’t want to change it up too much, so I used butter. I used Polaner all fruit spreadable fruit in place of the jam since it has a lower sugar content. Made these tonight with homegrown strawberries. Followed the recipe exactly and they are soo soo tasty! Hoping these will come out good with raspberries when they are in season. Thanks! Awesome! So happy you enjoyed them. I would have hated for you to waste your strawberries. :) Thanks for your comment! Thank you so much for your amazing recipes! I made this one and your pectin free jam recipe and both of them turned out so well! 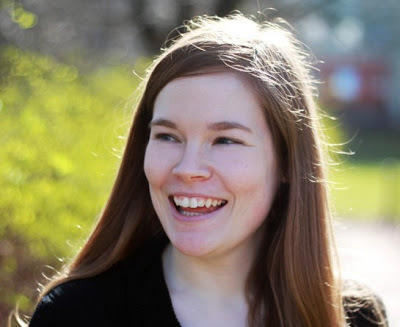 I did a little write up about both recipes on my blog that I just launched today (please let me know if I need to site you differently or anything like that – I’m still learning!) Looking forward to trying out more of your lovely recipes! If I can’t use wheat flour, what would use suggest I use instead? I really want to try these as they look so good! Hi, Paula! Can you not have gluten or just wheat? Can you have spelt? That’d work! I’ve tried these with oat flour for a gluten-free flour and they were too crumbly and just fell apart. You could try a 1-to-1 GF baking flour, though! I was in a pinch last night for a dessert for a last minute dinner party of 8. Everyone loved them! I will definitely be making these again and may try the coconut oil. Thanks, Erin! I’m so happy that they came out well! Especially for a last minute dinner party. :) I’m not sure if these will work with coconut oil – you may have to reduce it a little but I’m not sure. Thanks so much for the feedback! Thank you so much this recipe. It is definitely serendipity that I happened upon YOUR recipe today. I thought I made your recipe (but I didn’t!) because the OTHER recipe turned out very badly. It was way too dry (dense and thick oatmeal layer). I need to find a way to fix it (i.e. add more wet ingredients and turn them into oatmeal balls) and certainly never make that recipe again! You certainly have a delicious balance of fruit to oatmeal. I will keep you posted. Thank you for your many great recipes. Life is so delicious and healthy because of you! I did make yours and IT ROCKS! Thank you for creating a delicious and healthy strawberry oat bar recipe. It is the perfect summer snack with all the fresh berries available (to make fresh jam). Thank you, Erin!! Thanks, Susan! So happy that it worked out. :) And I think a autumnal version is needed now. Perhaps with apples and lots of fall spices? :) I think I’ll try that on the weekend! I made these today and oh my…. These are just heavenly! My house soooo good too! I will definitely try them with a strawberry-rhubarb mix too! So happy that you liked them! And I hope that you’ll like the rhubarb version just as much. :) Thanks for the feedback! How about switching the butter with some greek yoghurt? I’ll try this next time and I’ll try and let you know! I really liked those bars! These are absolutely delicious, I had to let you know that we made these yesterday for a dieting group and they were a smash hit. We went a little heavier on the strawberries and added rhubarb. The berries are fantastic! Please do another version. I’m so happy that you and the group liked them! More strawberries and rhubarb sounds great. :) I really loved these and want to see if I can make them a little firmer, so I’m definitely thinking about another version. Thanks so much for the feedback and the rating! Sorry you had a bad batch of strawberries :( What a major let down!! Erin, these look wonderful! That filling is oozing delicious strawberry goodness. Thanks for doing the hard work–butter it is! Strawberries and strawberry jam sound delicious! I like this type bar. These bars sound amazing! I love that the seem super easy to prepare and would be a perfect snack to take with me to work! These look divine to me! They look plenty firm. In fact, I’m firm on eating these for breakfast. And messy pie/bars/tarts almost tastes better……?!? Butter seems to be that one ingredient that I can’t compromise on! !